Wine making season is approaching. As a family activity or fun thing to do with friends, you could try making your own wine this Fall. Sparking is particularly fun to make at home in preparation for the Holiday Season. 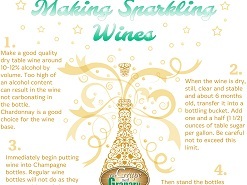 Plan in advance, because it takes 16-18 months to create your own sparkling wine at home. You first have to produce a good quality wine, around 10-12% alcohol by volume. If the percentage of alcohol is too high, you might not get the desired bubbliness you’re looking for in your sparkling wine. 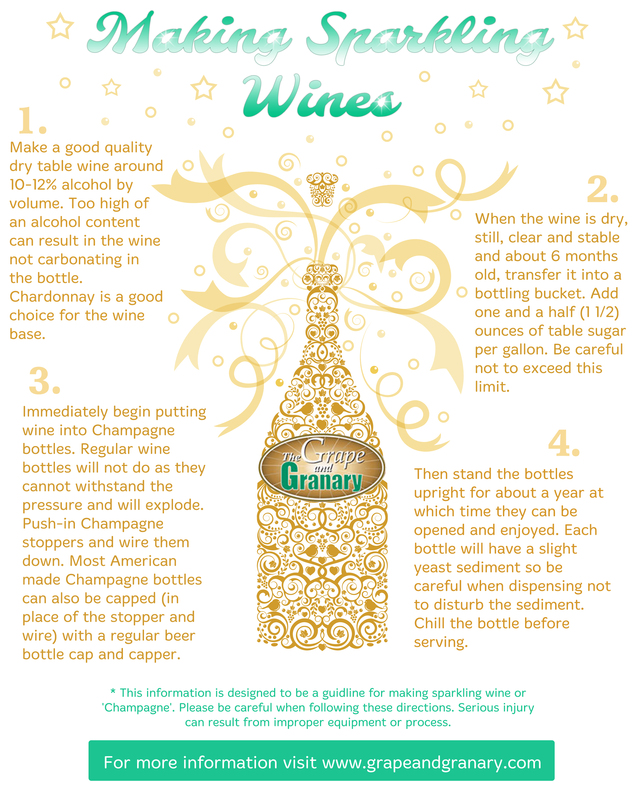 A good base with which to make sparkling wine is Chardonnay. About 5-6 months later, the wine will be dry and stable. Then you should at 1.5 ounces of table sugar per gallon of wine. Make sure you don’t exceed this limit, because the bubbly will turn out too sweet. Next, go ahead and bottle the wine with the added sugar in sparkling wine bottles. Sparkling wine bottles are created specifically to withstand the pressure of the carbonation, so it is important that you don’t use regular wine bottles. Push down the sparkling wine stoppers and wire them down. In some cases, you can use a beer bottle cap and capper to accomplish the stopping as well. Store the newly filled sparkling wine bottles in an upright position for about a year. After that, you can open and enjoy the bubbly when you get the notion. Be careful not to disturb the yeast sediment that builds up over the year. Always be sure to chill the bottle before serving so that you get the best taste. You’re new homemade sparkling wine is going to be delightful, and even better since you made it yourself!